Make new friends with a Stuffed Animal Sleepover! My library has offered two stuffed animal sleepovers in the past, and they've both been hits. I think the premise works on multiple levels: it's undeniably cute; it responds to children's treatment of their stuffed animals as real; it raises intrigue about what happens in the library after hours; and it offers a slight variation on the usual story time format. All these interesting aspects combined create a fun and unique opportunity for early literacy programming. I've shared full details of the logistics of this program in my previous two posts--animals dropped off the night before, me running around the library to stage sleepover pics of the animals, pickup at story time the next morning--so head to those posts if you're looking for point by point explanation of how a stuffed animal sleepover works. Sang some songs - We started story time with my traditional opening song, "Open, Shut Them." We also sang the "ABC" song because several children, when they dropped off their stuffed animals the night before, said that the "ABC" song was their animals' favorite. Adding little details like this--asking kids what their animals like, then doing those things--adds a whole other level of excitement and engagement in the event. Read some stories - I shared two stories with the kiddos that I had "shared" with their stuffed animals the night before. We shared Hugless Douglas and the Big Sleep by David Melling, as that story humorously deals with sleepovers. We also read Mo Willems's That Is Not a Good Idea!, which I said was the stuffed animals' favorite, and we talked about how what we thought was going to happen in the story isn't what really happened. Viewed the slideshow of sleepover pics - I used the Haiku Deck app to quickly put together a simple slideshow of the sleepover pics I'd taken on my iPad. Haiku Deck allows creators to share their presentations to the web, which made it very simple for me to email the attending caregivers so they could view the slideshow again at home. Breakfast snack - I passed around glasses of apple juice and some mini donuts. It's a post-sleepover snack, after all. Craft time - I stapled together three-page books out of white computer paper and set out lots of stickers and crayons on each craft table. 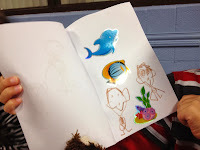 I invited the children to create books about their stuffed friends--about what they liked at the sleepover, about their favorite things to do together, etc. The creativity and thoughtful workmanship that went into these books was beautiful, as the children got very into creating accurate stories about their stuffed animals. At least half of the children wanted to read their stories to me before they left the library, and I was happy to hear them. This go-round of the stuffed animal sleepover saw a 50-50 mix of return attendees and new faces. From my perspective, that's a good indicator of a program to keep in mind for continued occasional repetition. My library district once again partnered with our local ambulance district to offer a slate of Halloween Safety programs at several of our branches this month. I've talked about this partnership in the past, and if you have the ability to create such a partnership with your local public safety folks, I highly recommend it. Kids especially enjoy getting to see inside an ambulance. If you don't have the ability to create this sort of partnership, however, that doesn't mean you can't tie some Halloween safety tips into an October program. Compliance and Safety shares some free tips for staying safe on Halloween addressing topics from costume safety, to food and candy safety, to other relevant details for families that may be planning to trick-or-treat. These are great tips to know from a reference perspective, and they can also make helpful asides in a Halloween program. I know that different libraries include (or don't) Halloween in different ways in their story time programs, from incorporating a single Halloween-themed story and craft into story time, all the way through having kids dress up and trick-or-treat through the library. Regardless of what your library does, consider making these Halloween safety tips available to the families you serve in some capacity. I've found that parents really appreciate the tips, and they also appreciate that the library cares about the safety of their children outside of library time. These small details really help us to build strong relationships with our service populations. Celebrate Fall with a Fall Festival! One of the programs I inherited when I started my job here two years ago was the school-age Fall Festival. The program originated with my colleague Angie, who now puts her excellent talents to use with teen services, but it was such a hit we wouldn't have thought to drop it. What's great about programs like an annual Fall Festival is that, even though you offer them every year, you can switch up the activities you do in them. You end up with consistent attendance without driving yourself mad through repetition. Best of both worlds. I got a bunch of mini pumpkins from a local market and set them out on dessert-size plates to minimize paint spillage. I set out a few autumn-like colors of paint, too: green, yellow, black, and purple, as well as some glow-in-the-dark paint that was a hit. As children got to the program, I encouraged them to get down to painting their pumpkins however they wanted. Now, this is a Fall Festival--not a Halloween program--so I included pumpkins without a directive of jack-o-lanterns or anything else Halloween-related. I found that the kids painted their pumpkins with hugely diverse designs with this minimal instruction; whereas instructions for a jack-o-lantern would have enforced some creative limits, free painting was completely open. Draw and Tell "The Night Walk"
I told the story of "The Night Walk" from the script and drawing notes on the Notes from the Story Room blog. The story follows a pair of siblings, professing boredom, who accompany their father on a walk outside at night. In the dark, they encounter plenty of new noises--including the sound of the creature that results from this simple draw and tell tale. 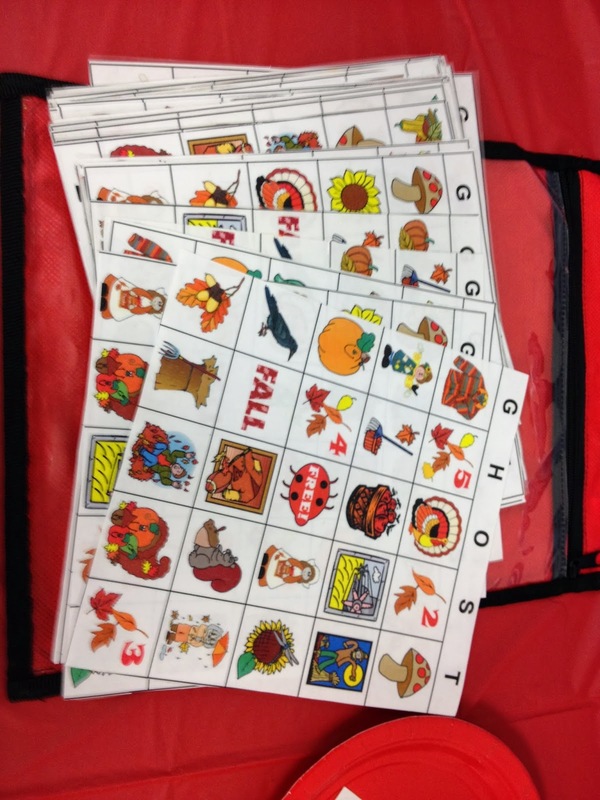 Several years ago, my colleague Angie created a set of bingo cards filled with autumn imagery. 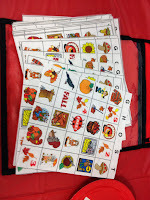 We break out these cards for the Fall Festival and put out candy corn on the tables as card markers. I call the pieces until every child has won at least once--yesterday we had enough time for everyone to win twice. Each win nets two prizes: a piece of candy and a book. I buy a variety of candy from the dollar store to make our sweets options, and the books consist of ARCs and leftover summer reading prize books. I love seeing that, while kids will choose a piece of candy without giving it any thought, they choose their books carefully. There are always a few kids who ask incredulously if they can really keep the books "for always"; I'm happy to tell them yes. There you have it: our high-energy, literacy-positive Fall Festival for school-age children. 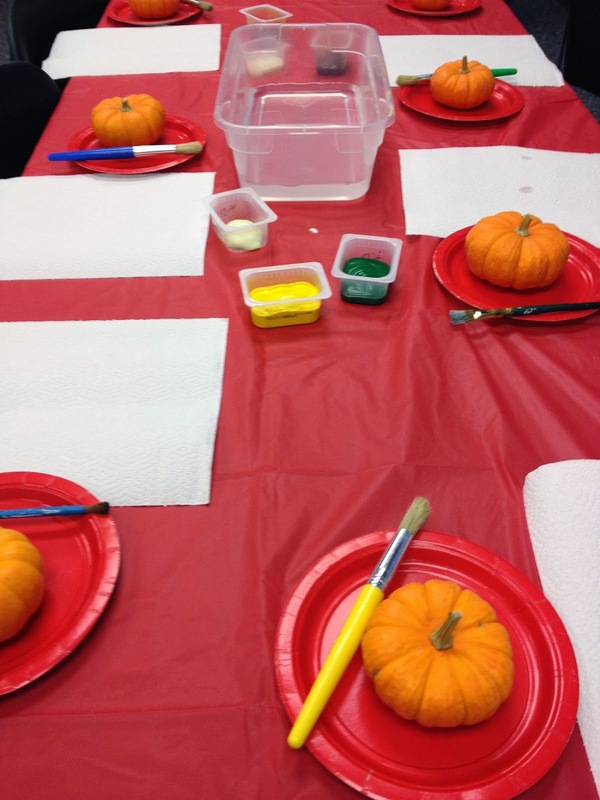 Do you offer fall or Halloween festivals/parties for this age group at your library? What do those programs look like? 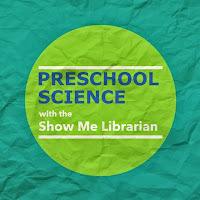 Yesterday I posted on the ALSC Blog my plan for a preschool science program on the topic of chemistry. Head over there to get full details on the story, talking points, hands-on activities, and take-homes to help children gain a foundation for understanding some basic principles of chemistry. Don't forget to share you own preschool chemistry activities and ideas in the comments! One of the longest-running, most successful teen programs at my branch also happens to be an excellent example of teen-driven unprogramming: Anime Club. Ice Breaker -- Sometimes the program leader (typically my teen person, Angie) leads a game as an icebreaker, but sometimes the teens are already comfortably chatty and so the program opens with fevered discussion of recently-discovered anime series. On occasions when Anime Club includes cosplay, the ice breaker takes the form of a cosplay show and tell. Library Tie-in -- The library has lots of manga options in the young adult collections, and often the newest additions to the collection will be featured in Anime Club. Stations of Stuff -- The crux of Anime Club is viewing anime, be it in the form of full-length films, episodes from series (both from the library's collection and using free online samples deemed appropriate by a few key club members), and online clips. Often there are other activities, too, including anime coloring activities, making candy sushi, and using elements of the Anime Club Kit sponsored by our Friends of the Library group. This kit includes several manga puzzles from Tokyopop, manga playing cards and card games, and a guide for creating manga. Social Time -- As with many teen programs, there isn't designated, separate social time; instead, teens converse throughout the program. Food -- Anime Club at our branch necessitates two foods on a semi-regular basis: Poky and Ramen. See also: the candy sushi mentioned in Stations of Stuff. Anime Club takes place the same time every month, and this regular offering has allowed a core group of between 8-12 teens to attend pretty consistently. After district-wide teen events, like the lock-in, our numbers get a boost from teens who frequent other branches that don't have their own Anime Clubs. Anime Club has built a great camaraderie among the teen library users who might otherwise not find a niche outside of the manga section. Their enthusiasm for anime, and their suggestions for great films and series to consider for inclusion in the library's collection, really carries the endeavor and ensures that they feel a sense of ownership and belonging in the program. For relatively little staff and program cost, that's a lot of engagement by teens. That's the hallmark of a great unprogram. Bianca Schulze at The Children's Book Review recently asked me some questions about librarianship and what goes on at my library for the site's monthly "On the Shelf" column. It was a pleasure to respond to these questions, which got me thinking deeply about what I do in the library and why. Head over to The Children's Book Review's latest "On the Shelf" column to see my responses, then stick around on the site to explore the plethora of fantastic resources they have to offer librarians, teachers, and children's literature enthusiasts alike. Maker spaces have been something of a libraryland topic du jour recently, and youth services most definitely has a role to play in the maker movement. Really, youth services is where it's at--where making has always taken place. Currently, there's the idea that maker spaces necessarily involve often-expensive equipment: 3D printers, woodworking tools, looms, soldering irons, computers with a gamut of fancy design software. These tools are great, no doubt about it, but they do not a maker space make. Think of all those crafts and open-ended building activities libraries have been hosting for children for decades. That's making right down to the core. We were making in the children's room long before maker spaces were cool. 1. Open-ended Activities -- While I agree that kids need to learn to follow directions and thus product-oriented activities have a benefit, I think open-ended activities are much more conducive to that making mindset. 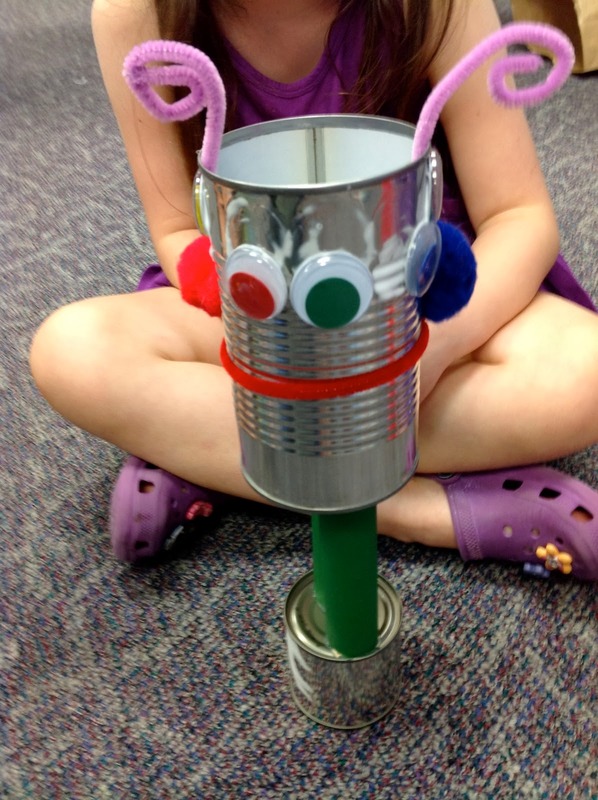 Open-ended making activities for kids can mean creating aliens--you decide what your alien looks like. It can mean choosing from a variety of techniques to create greeting cards for friends, children choosing the methods and materials they want to employ. Open-ended can mean we all have similar goals, but how we accomplish them is up to us. It can also mean a total free-for-all, open creative space in which the sky is the limit. 2. Variety of Supplies -- Making is so much more interesting and creative when you have lots of tools and supplies to choose from. That fact works wonderfully with the realities of youth services, where we always have odds and ends left over from various crafts and activities. Making those aliens? Have a myriad of recyclables and leftovers to use as alien body elements. Offer different types of tape and glue so kids can choose what they think is appropriate for their individual creations. Don't assume everyone will want to use the same materials, and don't stifle by limiting supplies to just what you think you'd need to make the "sample" creation. Variety also allows makers to explore materials and techniques they've never experienced before, creating a truly valuable informal learning experience. 3. Plenty of Time -- It takes time to create. 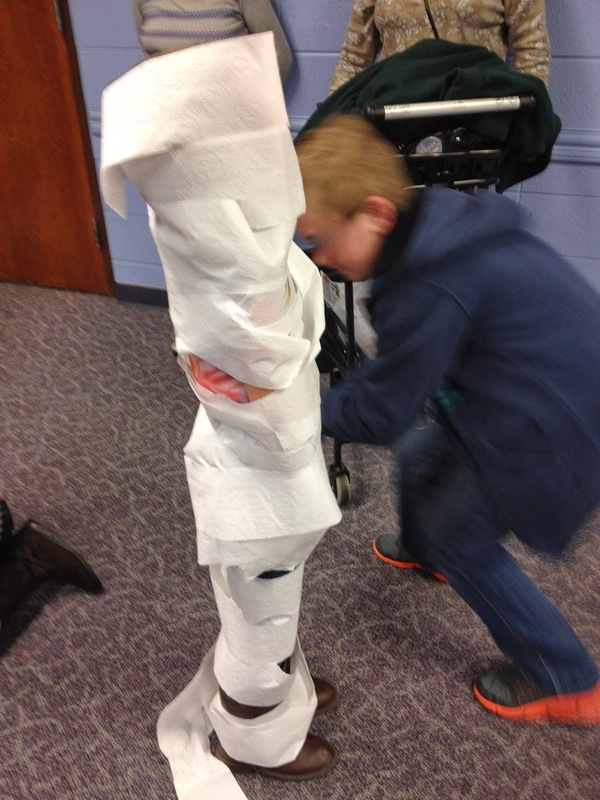 In a library program space, kids need to get situated and get comfortable with the idea of their maker task; only then can they actually start to create something that is meaningful to them. And so time becomes a huge necessity: there needs to be plenty of time for kids to think, to explore and experiment with the materials at hand, to try out different techniques, to see what their neighbors are doing, and to change their minds. Short time limits and strict activity-to-activity schedules lead to unfinished products and creations kids don't care much about; time breeds challenge, creativity, and innovative thinking. 4. Display Space -- Having a designated area in which to display children's maker space creations is wonderful. It advertises the types of maker activities other library customers could enjoy, and it allows the makers to feel pride in both their creations and the library. 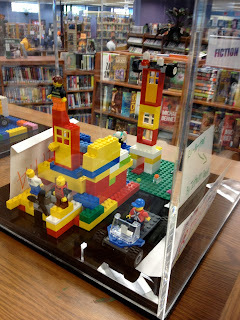 My library displays kids' LEGO Club creations every month on top of our reserves shelving, which is a high-traffic area. Display space can be at a premium in a library, though, so happily there are alternatives to physically displaying creations in the library. One option is to take pictures of the creations and print out a few for a library bulletin board. Another is to upload those photographs to the library's Facebook page or Flickr account. (Want lots of folks to visit your social media pages? Tell caregivers they can see their kids' creations on your pages, and *BOOM* hits galore.) You can even go all out and offer a gallery-style program in which all the various creations from library programs are on display in the program room. In my philosophy, if you have most or all of these components in any of your library activities, you're providing the kids you serve with a maker space. You don't have to call it a maker space. Chances are many of your customers don't even know what a maker space is, so the name isn't all that important. What is important is to offer youth the space, materials, and opportunity to engage their brains in hands-on creation. No curriculum, no specific desired final product. Just plain old making fun. I've shared my maker philosophy in connection with my panel for The Digital Shift: Reinventing Libraries, titled "The Community Joins In: Library Maker Spaces." I'd love for your to share your philosophies on maker spaces with youth in the comments, too. If you use my blog as a STEAM resource, you may also be interested in finding grants specifically for STEAM initiatives to help you fund your programs and services. 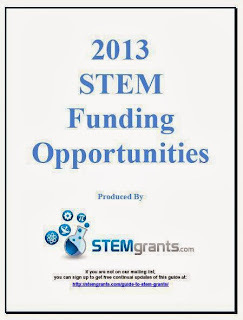 I'm happy to report that the folks at STEMgrants.com have just released their 2013 STEM Funding Guide, which includes funding opportunities available through April 2014. Interested? Go to their site and enter your e-mail address, then they'll immediately send you the 18 page guide with plenty of funding opportunities. I've only ever received the grant guides from them, so no need to worry that by entering your e-mail address you'll be subjecting yourself to messages you don't really want. Sign up and take a look at all of the diverse funding options. Make your proposals, get your grant funding, and make sure to share the awesome programs you put on with that financial support! I took a detour from my usual Milk & Cookies Story Morning for this month. My planning process was starting to feel a bit too formulaic, which was harshing my story time juju. 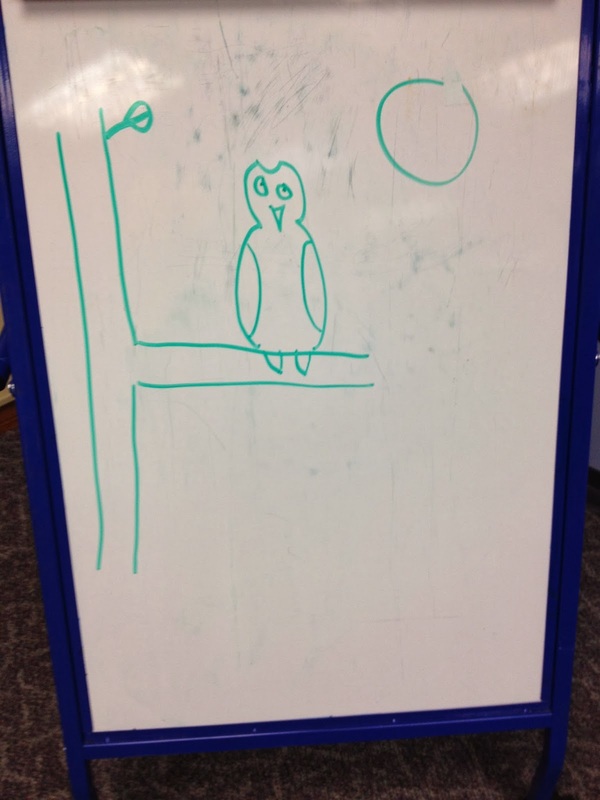 I decided to go ahead and put together a story time with a different set of goals for myself: use picture books of the "new books" shelf at my library and sneak in early literacy messages about all five practices. The challenge was invigorating for me, with fun interactive results for the kiddos. This rhyming counting story is excellent for those looking to add a spooky story to story time without being explicitly Halloween. 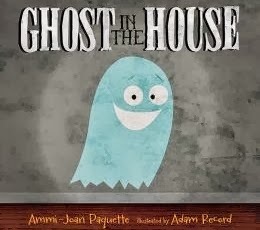 A ghost starts out in a house all alone, but he hears various eerie noises--a groan, a growl, and shriek--and one by one he's joined by other monster characters. Don't worry, though; the illustrations are cartoonish and not frightening. The kids had lots of fun mimicking the sounds of the monsters, especially the click-clack of a skeleton. This is a great story all on its own, but it would pair really well with Go Away, Big Green Monster to emphasize monsters are nothing to be afraid of. *Talking Tip: Imitating the creatures we see in books helps children become familiar with the range of sounds that occur in spoken and written language; their familiarity with all sorts of sounds will help them when it comes time to sound out words. 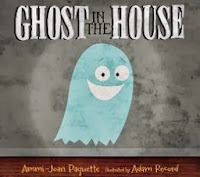 We danced around like monsters to this fun, silly song from one of my favorite musicians for story time. RAWR! I handed out scarves to all the kiddos in the room, then we shook those scarves with gusto as suggested by the song. What a great way to get the energy pumping! *Singing Tip: Singing repetitive songs with children is great because they reinforce new and important vocabulary. Our song included lots of words about directions: around, side, front, back, high, low. We learned all those words while having fun! It's no secret that I loved Dyckman's Boy + Bot, and her newest story is another great look at an unlikely friendship. 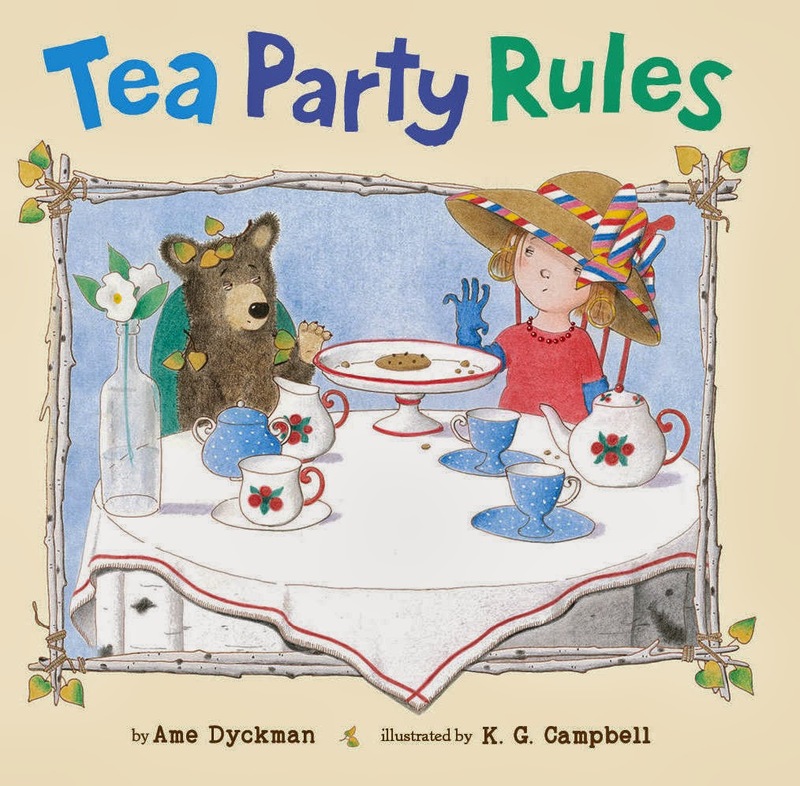 Cub, a young bear, stumbles upon a tea party table with lots of cookies, but the tea party hostess--a young girl--has several rules to which Cub must adhere before he can get to the cookies. The expressive pictures add to the humor of this story. 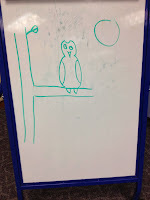 I wrap up the story by asking the kids what they would like to play: tea party or bear. *Playing Tip: When children play, they get to experience the world and how it works in a safe space. 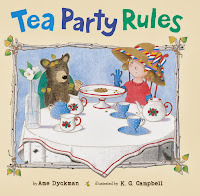 Playing tea party or pretending to be a bear is really a learning exercise; they get to practice table manners, try out having claws, and use all sorts of words that go with special scenarios. After three tosses and a roll of the song cube, we were prompted to sing this classic song which paired perfectly with the preceding story. Serendipity! Another toss of the song cube led us to sing the fingerplay of "Five Little Ducks." We worked on getting our fingers to show the appropriate number of ducks, and we had plenty of fun quacking loudly as the mamma duck. 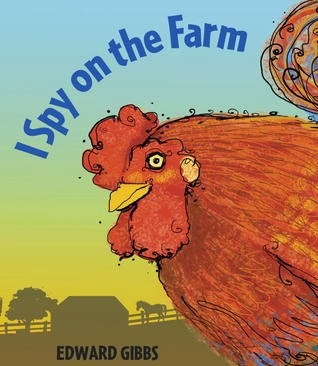 This companion to I Spy With My Little Eye contains a great variety of farm animals to spy and guess. Kids are prompted to guess the spied animal by its color and the sound it makes, just like in the companion book, with one great addition: the text says the letter the animal begins with. When sharing this story, I like to say (for a duckling, as an example): "This animal starts with 'D.' Can you use your finger to draw a 'D'? The 'D' makes a 'duh' sound." I love the added element of drawing letters. *Writing Tip: Writing together doesn't have to mean using pencil and paper. Your child can draw in the air, in bubbles in the bathtub, or in a pan of uncooked rice--these are all great ways to get familiar with creating and recognizing letters. What can I say? I just love this song, and so do the kids, and thus I will happily repeat it a second month in a row. *Reading Tip: Don't forget that there are lots of books on display next to me that you can check out and read at home! Reading together with your child is a great way to have fun together, and it also promotes a love of words and reading in your child. If you show that you enjoy reading together, your child will love it, too! Honey Teddy Grahams and 2% milk. Mmm. I set up four free play stations on the play side of our meeting room: vehicles and garages; play food; puzzles and writing; and science, with magnets, scale, and creature building. One mom in attendance told the whole group that our local fire house was having an event that same day: all the fire trucks would be out of the station and kids could tour them and find out more about being firefighters. That tip meant most of the families didn't stay to play for much longer than 20 minutes--they all wanted to head over to the first station. 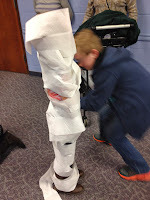 We had a great time while the kiddos were in the room, however, and I engaged in quite a few conversations with the children about what they were doing. I got plenty of insight into how a child works through a puzzle. Fascinating! If you're in the mood for some free, during-the-workday, thought-provoking professional development, it's my pleasure to direct you to The Digital Shift: Reinventing Libraries, a free online conference-style event from Library Journal and School Library Journal. The event will take place this Wednesday, October 16, from 10 a.m. - 5 p.m. EST. The event formally kicks off with a keynote panel moderated by Rebecca Miller, the editor in chief of both libraryland publications. From there, attendees have a number of options for how to structure their days: there are a variety of sessions across three broad categories (instruction, community, and collections); virtual poster sessions; and virtual exhibits open throughout the day. There will also be a closing keynote on connected learning to bookend the day. Don't forget there will be plenty of opportunity for networking and talking shop--virtually, of course--on Twitter! All sessions will be archived for later viewing by registered participants, so sign up even if you're busy on Wednesday. I will be co-presenting one of the sessions in the community category. During "The Community Joins In: Library Maker Spaces," which starts at 12:15 p.m. EST, Justin Hoenke of Chattanooga (TN) Public Library, Michelle Cooper of Henderson High School, and I will be talking about the maker movement and how it ties into youth services for both children and teens. 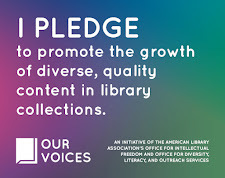 Our goals are to unpack the maker movement and demonstrate strategies for libraries to engage in that movement in a way that benefits young library users. I've got some awesome co-presenters, and I hope you'll check out what they have to say. Check out the webpage for The Digital Shift: Reinventing Libraries to see the full scope of content that will be shared this Wednesday. If anything seems of interest to you, go ahead and register--you can plan to attend the live event, or instead wait for the archived sessions to watch at your leisure. Either way, you've got some great professional development coming your way. Get/Make a sensory blanket for babies. This simple and brilliant idea was shared, as a brief part of a larger idea, by Stephanie Smallwood of Springfield-Greene County Library District during her session on taking early literacy to outreach. Sensory blankets are soft quilt-like blankets, with patches and sections of fabrics with different textures and sensory features sewn into the main blanket fabric. Think a touch-and-feel board book in quilt form, ready to be taken anywhere, laid on the floor, and machine-washed when needed. Genius. Create a designated science area for children, and operate it thoughtfully. I'm taking Stephanie Smallwood's broad preschool STEM idea and applying in more broadly and with more specifics. In my carved-out science space in the branch, I'll keep the science items/theme consistent for an entire month. Use rocks as an example: rocks will by at the science station all month long. For the first two weeks of the month, the station will be about engaging with rocks: lots of varieties so kids can explore what they look like and how they feel, and also including books on the topic to help kids (and caregivers) answer questions they may have. During the second two weeks of the month, the rocks will stay the same but additional elements will be added for experimenting with rocks: a scale to weigh, magnifying glasses to look closer, a tub of water to test buoyancy, for example. 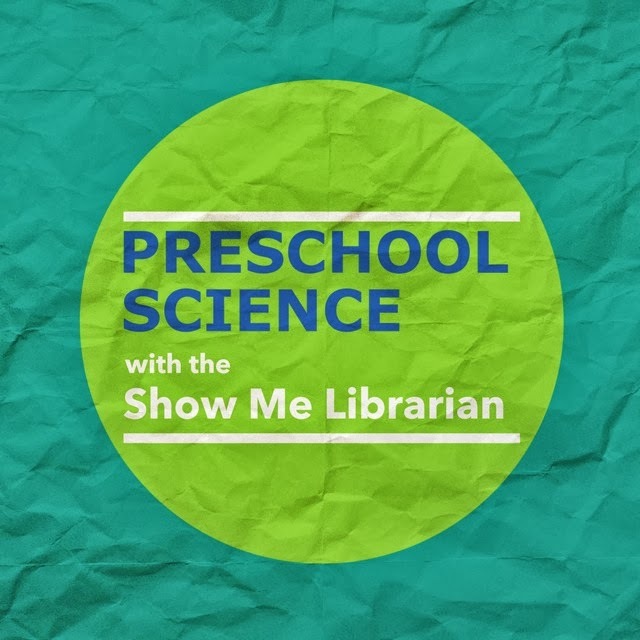 Over the course of a month, when a child may visit the library two or more times, he or she gets to first engage with the STEM concept and then experiment with it, allowing for deeper concept learning. There's no reason this strategy would apply only to preschoolers--I can think of many a school-age child who would be fascinated by said science station. Use the Recaptains (recaptains.blogspot.com) for help catching patrons (or myself) up on series backstory before reading a new release. Enough said. Keywords for database instruction with school partners are "easy" and "visual." Teachers are super busy with nary a spare moment in their schedules; if we want to entice them with databases and all they can do, we need to emphasize that we can provide tools to make aspects of their jobs easier. For students, be they elementary, middle, or high schoolers, visuals are important. Share the databases with visual interfaces and they'll be much more open to learning how to use them. Partner with lots of community organizations to support early literacy initiatives, even those organizations that may seem less obvious. Stephanie Smallwood talked about some of her library's community partners, ranging from the traditional (WIC) to the less common but really smart (The Doula Foundation). There are many, many community organizations with potential to impact families in a positive way; the library should work with them. Provide early literacy training for the staffs at partner organizations. The library has the potential to interact with families who utilize these organizations only while a library staff member is present and conducting outreach. Organization staff, on the other hand, have much larger windows of opportunity for interacting with these families--basically, anytime they visit. By providing early literacy training to the staff at partner organizations, not only do these staff get a greater understanding of why the library is involved, but they also develop their own skills and knowledge to share early literacy messages and resources with families during the course of their regular interactions. Have you been to a conference lately? What were your favorite takeaways? I recapped for Storytime Underground the Guerrilla Storytime that took place last week at the 2013 Missouri Library Association Conference in St. Louis. Between the twenty-odd participants, great questions and idea-sharing, and recycling bin filled with ice and beer, it was a mighty productive evening. Check out the recap on the Storytime Underground blog! and ways to use digital media in story time settings, both in existing programs and in new initiatives made possible by new media. At the end of the session, in addition to answering some questions about the logistical aspects of using new media in the library and our state's great tech mini-grants, I mentioned my handout. This handout is packed with resources for finding helpful app reviews, useful program plans and ideas, and apps that promote the 5 early literacy practices. If you're interested in seeing this handout, complete with links to everything I mention, click here. Thank you to everyone who attended my Digital Story Times session; I hope anyone with an interest in the topic of new media and early literacy will get in touch with any questions or follow-up thoughts. As readers of this blog have likely noticed, I care about STEAM programs and services for kids. I think it's particularly important to share details about my own STEAM programs and services, both here on this blog and elsewhere in libraryland; sometimes a bit of info, a testimonial, or a ready-to-go program plan is all that stands in the way of another library trying STEAM, and thus reaching a new, possibly-untapped audience of young library users. I know I'm not the only librarian doing and talking STEAM--not by a long shot! And that makes me very, very happy: to see children's interests piqued and multiple literacies developed through great STEAM activities and reads offered by their libraries. 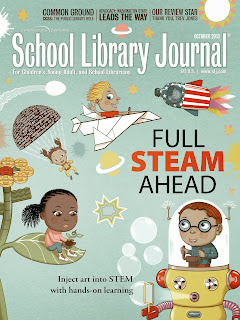 The fact that I'm just one voice in a growing community of STEAM practitioners leaves me feeling incredibly humbled by a recent opportunity: to talk STEAM in SLJ. The cover feature for October's issue is titled "Full STEAM Ahead: Injecting Art and Creativity into STEM," and I sincerely hope the article will facilitate conversation about STEAM in library services for youth. We all have lots to learn from one another, as well as plenty of ideas to share.